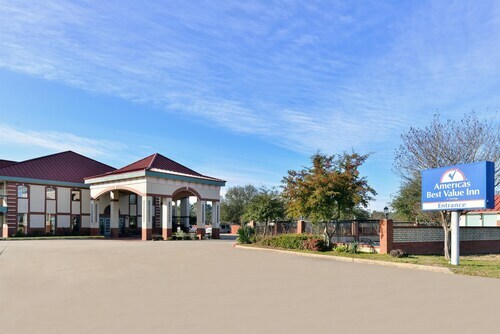 Situated in Texarkana, this hotel is within 1 mi (2 km) of Arkansas Convention Center and Holiday Springs Water Park. Spring Lake Park and Texarkana Convention Center are also within 3 mi (5 km). Situated in the business district, this hotel is within 1 mi (2 km) of Texarkana Convention Center and Central Mall. Texarkana College and Spring Lake Park are also within 2 mi (3 km). 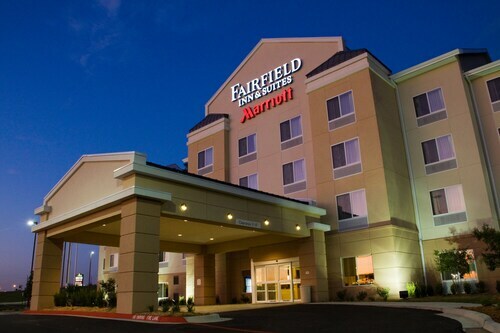 Situated in Texarkana, this hotel is within 1 mi (2 km) of Texarkana Convention Center and Central Mall. Texarkana College and Spring Lake Park are also within 3 mi (5 km). 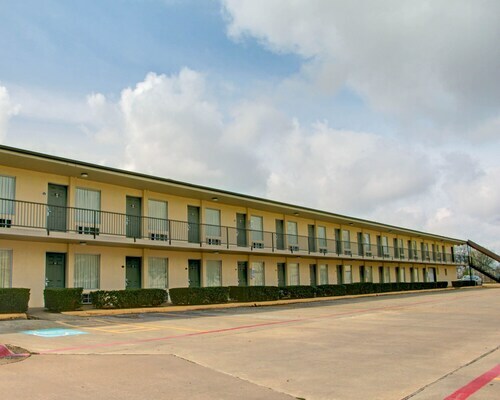 Situated in Texarkana, this hotel is within 1 mi (2 km) of Central Mall and Texarkana Convention Center. Texarkana College and Spring Lake Park are also within 3 mi (5 km). 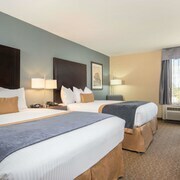 Situated near the airport, this hotel is within 1 mi (2 km) of Arkansas Convention Center and Holiday Springs Water Park. Spring Lake Park and Texarkana Convention Center are also within 3 mi (5 km). Situated in a rural location, this motel is 1.2 mi (2 km) from Trail Head Park and 2 mi (3.2 km) from Tapp Park. Oak Grove Golf Club and Wright Patman Lake are also within 12 mi (20 km). Situated in Texarkana, this hotel is within 2 mi (3 km) of Arkansas Convention Center, Spring Lake Park, and Holiday Springs Water Park. Texarkana Convention Center and Draughon-Moore Ace of Clubs House are also within 3 mi (5 km). Located in the heart of Texarkana, this hotel is within 1 mi (2 km) of Texarkana Convention Center, Central Mall, and Texarkana College. Spring Lake Park and Arkansas Convention Center are also within 3 mi (5 km). How Much is a Hotel Room in Texarkana? Hotels in Texarkana start at $44 per night. Prices and availability subject to change. Additional terms may apply. Thanks to Travelocity, you are spoilt for choice when it comes to finding vibrant hotels and apartments in Texarkana. Approximately 29 places to stay are on Travelocity inside a 6-mile (10-kilometer) radius from Texarkana's urban core. You can stay at one of TownePlace Suites by Marriott Texarkana and Hampton Inn & Suites Texarkana within an easy walk from Texarkana's city center. If you are planning a Texarkana visit, but have a limited budget and simply are hoping to find the most affordable hotels, our hotel database has enough economy places to offer you in the vicinity. 1 mile (2 kilometers) away from Texarkana's downtown area you'll find the Candlewood Suites Texarkana. The Wyndham Garden Texarkana is just 2 miles (3 kilometers) away. Two more budget-aware options in Texarkana include the Rodeway Inn and the Magnuson Hotel Texarkana. You should investigate the Hilton Garden Inn Texarkana as well as the Holiday Inn Express & Suites Texarkana. The Hilton Garden Inn Texarkana is situated just 1 mile (2 kilometers) from the heart of Texarkana. 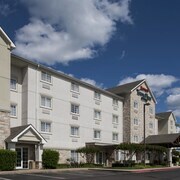 The Holiday Inn Express & Suites Texarkana, is 1 mile (2 kilometers) away. 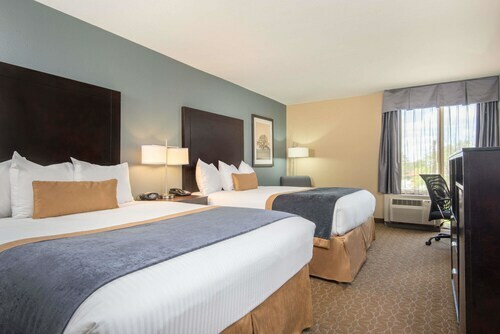 The Holiday Inn Express Hotel & Suites Texarkana East and also the Courtyard by Marriott Texarkana are some alternative places to base yourself around Texarkana. The larger Piney Woods region is certainly worth exploring too. Fall in love with Piney Woods's forests. In addition, you should discover a selection of its historic mansions and history museums. Visitors and locals alike in this pocket of United States of America adore mountain biking, hiking and four-wheel driving. Mount Pleasant is 55 miles (91 kilometers) west of Texarkana and is home to Mount Pleasant Country Club and Shadow Lakes Golf Course. A few Travelocity-listed Mount Pleasant hotels include the Hampton Inn and Suites Mt. 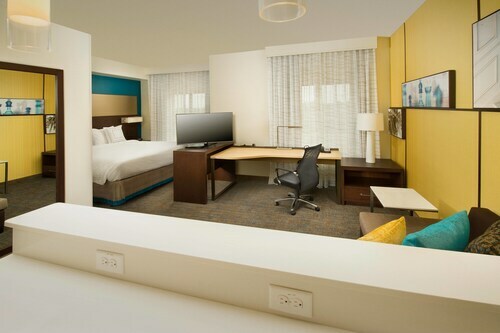 Pleasant and Holiday Inn Express Hotel & Suites Mount Pleasant. 25 miles (37 kilometers) to the west of Texarkana, you can also stay at New Boston, which features the Holiday Inn Express & Suites New Boston and Americas Best Value Inn New Boston. The Tapp Park and Trail Head Park are a couple of the more popular attractions to visit when you're in New Boston. Situated 4 miles (6 kilometers) away from Texarkana's center is Texarkana Regional Airport. Base yourself in the area at Hampton Inn Texarkana Arkansas or Holiday Inn Texarkana Arkansas Conv Ctr.